Yep, you sure did hear me right. I hereby declare these a thing. This recipe idea came about because for some crazy reason, I love the idea of creamy tomato soup and grilled cheese sticks on Halloween. Particularly, this tomato soup with these grilled cheese sticks, but that’s neither here nor there. I knew that I couldn’t put ACTUAL tomato soup in my pasta (um, what) but I wanted to mimick the feel! My mom never made tomato soup when we were growing up, so it was something I learned to love as a comfort food only a few years ago. I have some major requirements though. It must be creamy. Like have the addition of actual cream. It must be ever-so-slightly hinted of basil. It must also be a little sweet! Basically it must taste as good or supremely better than Nordstrom café’s tomato soup. ALSO. I need to tell you something. Mother Lovett. Guess what she used to do? Well wait. First – you know how I always say that Italian cuisine is my least favorite? I’m sure it’s because I don’t have any Italian genes and never ate GOOD authentic Italian food as I was growing up. So. Guess what Mother Lovett used to do? You’re going to die. She would use campbell’s tomato soup… as tomato sauce. Yeah. Like as her spaghetti sauce. No, I never had the (unfortunate) pleasure of trying this, for it was long banned in her house before I was born. This was waaaaay before my time, like back when my mom was a tween. But I’m sure it’s the inherent reason for my tomato abhorrence. Annnnd now you know why I’ve never cared for tomato sauce. 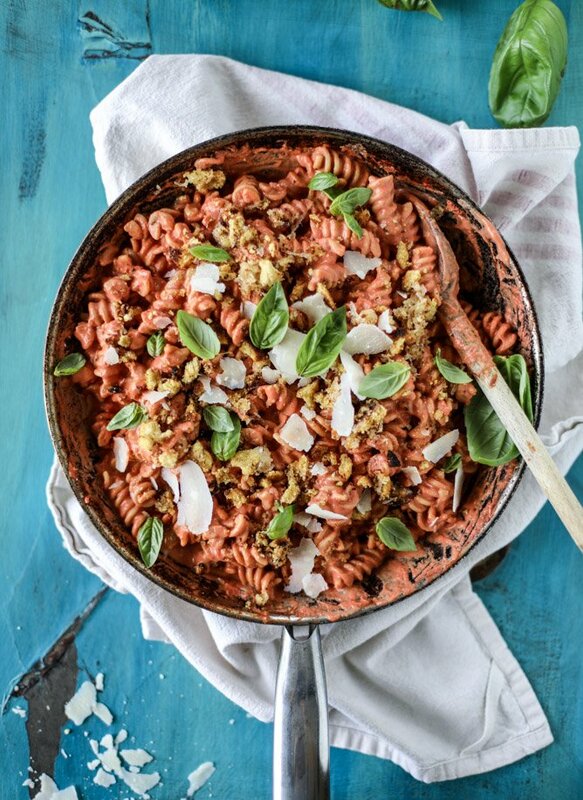 And why I do such blasphemous things to tomato-y pasta like cover them in crumbs with bread and cheese. But let’s be real, “abhorrence” is quite strong. I no longer ABHOR tomato sauce. When tomato sauce is swirled with cream, or in this case, OMG mascarpone cheese!, I could easily consume it weekly. Maybe daily. The mascarpone cheese is so rich and cuts the acidity. It makes it so much creamier than actual cream does! It’s comfort food. Topped with more comfort food. Heat a large skillet over medium-low heat and add the olive oil. Stir in the garlic, oregano, basil and red pepper flakes, cooking for 1 to 2 minutes. Pour in the tomato puree and stir. Cook until the sauce is warm and the garlic infuses it, about 10 minutes. Once warm, stir in the mascarpone cheese. It will turn the sauce pink and become creamy and delicious! Taste the sauce and season if desired. You can add salt, pepper or even a touch of brown sugar if it’s still acidic. Stir in the cooked pasta right before serving. Top with the grilled cheese crumbs, shaved parmesan and fresh basil. Heat a saucepan or skillet over medium heat and add the olive oil and butter. Once sizzling, add in the pieces of bread and stir. Cook and toss, stirring often, until the crumbs toast and become golden. You want them crunchy! Turn off the heat and let the pan sit for 1 minute. Add the grated cheese and toss for a minute or two, until it’s dispersed through the crumbs. It will melt and some pieces will get crunchy. Delicious! LOVE this creation, as well as the backstory; and oh my goodness, Nordstrom Café’s soup has nothing on this deliciousness. The moment I saw #grilled cheese crumbs’ though…I might cry, that sounds so good!!! Fabulicious!!!!!! I’m so doing this! 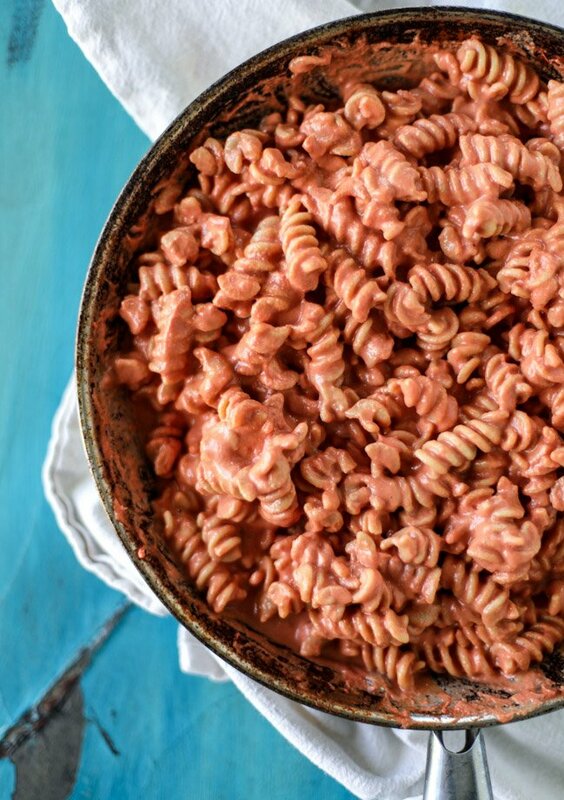 Creamy tomato pasta sauce is probably my fav of all time. It’s so easy and comforting. AND GRILLED CHEESE CRUMBS?!?! I’m dead. Omg, Mother Lovett. I can’t with the tomato soup as tomato sauce. Nooooooo! One of my favorite lunches of life is Trader Joe’s red pepper tomato soup with grilled havarti cheese on a pretzel bun. That’s 3 ingredients total, and one of my fave meals of all-time. Lol! This is 1000x better though. The grilled cheese crumbs are dynamite. It’s funny – tomato soup w/ noodles is probably a thing, but why does putting tomato soup itself over pasta sound really strange?? You found a way to make that it a sauce though and be a totally awesome dish! I LOVE tomato soup with a grilled cheese sandwich, and the fact that this also involves pasta, omggggg. Trying this asap! Grilled cheese crumb?! Oh my god. I need to do this for all of my future pastas! As soon as I saw you Insta post last night, I knew this was gonna be GOOD! Thank you for making grilled cheese crumbs a thing! This is so the ultimate comfort pasta. LOVE! STFU, mascarpone in tomato sauce!? YES! This may be the key to me slowly hating tomato-y sauces less. Also, cabs on carbs with cheese?! Can’t go wrong. Your tomato soup _ grilled cheese dippers is on the menu for Sunday (I know, I know, hates tomato sauce; slightly tolerates soup) but there’s nothing better than tomato soup + grilled cheese esp. when it isn’t from a can anymore. And yes, must have basil and a very liberal sprinkle of parm at serving. Ina Garten’s cream of fresh tomato soup is so good – it meets all of your requirements. You have to try it! I can’t wait to make this pasta. Grilled cheese breadcrumbs!!! Grilled cheese crumbs?! OH YEAH! This is awesome girl! So, uh, one time I made pasta and THEN realized I didn’t have any tomato sauce. Soooo I used Trader Joe’s tomato soup (which, if you haven’t had it, is SUPER creamy) instead. OMG THE BEST. I’ve never gone back. So when you said you can’t put actual tomato soup on pasta, ?? totally here to tell you you can. But OMG, mascarpone is SO MUCH BETTER. And grilled cheese?! You’re an absolute savage and I am obsessed. I guess I’ll make this one recipe …. My mother used ketchup for tomato sauce!!!! And… um…. I do the same for my son! He loves it (sweeter than pasta sauce) even though people think it’s gross. This looks so good! So so good! Grilled cheese crumbs definitely deserve to be a thing! Words cannot even describe how much I need those in my life right this second! I’m using it now and it’s awesome! I’ve signed up for my account and have been bringing in fat paychecks. For real, my first week I made $305 and the second week I doubled it and then it kinda snowballed to $120 a day…. My mom ate pasta with tomato soup growing up! I think it was more because it was a cheap dinner since they were usually struggling to get by. But now she would never eat pasta that way! Just made this for dinner and oh my gosh this is unreal. I could NOT believe how silky the mascarpone made the sauce. And don’t even talk to me about the grilled cheese crumbs. Sent you a snap of it! Great collection of recipes. I would like to add a link to this page from my website, would you be okay with this? 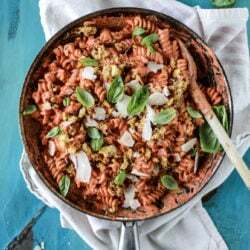 These recipes are great for people that are new at making pasta and want to learn more recipes, and I think these recipes could help out a lot of my visitors. Thanks in advance! Pingback: 7 awesome pantry dinner recipes for when you don't have a meal plan. If I wanted to add sausage to this recipe (ground removed from the casing) at what point in the cooking would you recommend I add it in? I have been cooking like crazy due my loved ones impacted by the camp fire in CA. Just made this and it was freaking amazing! I didn’t have any tomato puree, but I just blended some tomatoes I had and added some tomato paste and water. It worked like a charm. Thanks for making such a comforting recipe.